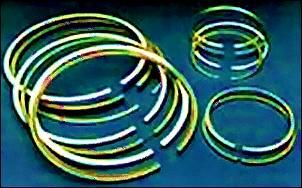 Most piston ring manufacturers generally make piston rings for the original engine as well as for engines being reconditioned, and in such cases they will specify several ring set types, selected to be the most suitable for the situation. Piston rings specified for an original engine will be designed to achieve maximum durability and rapid bedding-in and the quality and type of bore surface finish specified by the engine manufacturer will be taken into account. For example barrel lapped chromium plated rings may be specified for a new engine but some ring manufacturers with particular experience in aftermarket situations may specify a different top compression ring if the intended use is primarily for re-ringing an old bore. This is especially so when the nature of the honed bore surface achieved by the reconditioner is unknown. Plain faced, torsional twist, or even taper faced rings (in both grooves) will be more tolerant to variations from ideal surface finish, even in worn but unhoned cylinders, so many aftermarket sets feature such variations from original. Likewise, oil ring wall pressures may be higher in aftermarket sets. In an engine which has been subjected to abrasive wear, the compression rings will usually wear on the lower face as well as on their outer face. In fact, in an engine which has molybdenum inlaid top rings, the outside faces of the rings often show little wear because of the wear resistance of the molybdenum inlay, however the sides of the rings often provide evidence that there has been abnormal wear. Look for a ridge on the outer edge of the lower face. If there is a ridge sufficient to catch a fingernail it is a sure sign that there has been rapid and abnormal wear because under normal operating conditions such a ridge would not appear inside 100,000km. This ridge indicates that the wear has been sufficient to increase side clearance. Too much side clearance allows the ring to move too much in its groove and this not only is a self-worsening situation, it also causes high oil consumption due to oil being pumped up into the cylinder bore via the back of the ring. Oil ring rails also can give a positive indication of abrasive wear. The chromium outer layer is plated at a thickness of 0.003" minimum and it lasts virtually the life of the engine. If subjected to abrasive wear, due either to poor oil filtration, or honing grit left in the bore after honing, the layer of chromium will wear away, exposing steel. This is readily detected by using copper sulphate solution, available from a chemist. When it is smeared on the surface, it will react with any steel exposed, leaving a copper deposit. If steel is exposed, the wear rate for any reasonably new set of rings has been abnormally high, and the cause of the rapid wear must be found. 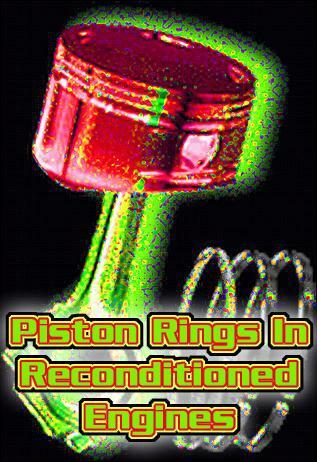 Always make sure the pistons to be reused are in good condition. Things to look for include: freedom from cracks, scuffing or excessive wear in the grooves and pinholes, skirt wear, erosion damage to crown and integrity of the circlips and their grooves. The top ring groove must not be cracked or have any appreciable wear on either the top or bottom face and the new ring must have no more than 0.004" side movement. Make sure that the bores are free of scoring or scuffing, any wear ridge at the top, or any undue distortion, wear or taper. If necessary, hone the bores but if you do hone then DO IT PROPERLY! If you do hone the bores they MUST be scrubbed clean with hot soapy water and a stiff brush, then cleaned and swabbed with engine oil. Finally check for any grey residue with a clean white cloth. 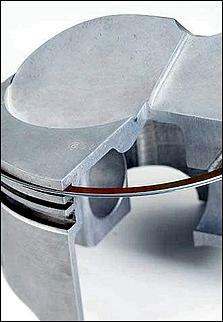 The ring set you choose must be compatible with the grooves in the pistons. This means that there is adequate back clearance so that the rings can be pushed back into their grooves without any protrusion beyond the lands. This is especially important when the rings are not from the same supplier as the pistons. Check the gaps of all rings. Top and second ring gaps should be approx. 0.1 - 0.15 per 25mm of bore diameter. Rail gaps should be approx. 0.2 - 0.4 per 25mm. Do not wind compression rings into their grooves. This might distort them. Open their ends gently with fingers (or preferably a ring opening tool) and place them into their correct grooves. Check that the compression rings are fitted the correct way up. Any identification marks such as the manufacturer's name, or dimples etc. must always be UPWARDS. Many top rings are directional and must be fitted correct way up, and ALL second rings are directional. Common mistakes in the fitting of three piece oil rings include; placing the rail gaps too close to each other (they should be separated by at least 1/3 of a turn); placing either rail gap close to the expander gap (should be at least 1/3 of a turn away), and allowing the expander ends to overlap (they must NOT). Before installation into the bores check that there is adequate back clearance for all rings. See item 4 above. Make sure the rings are free to rotate in their grooves. A useful tip for making sure the oil ring load is OK is to see if after assembly to the pistons, the rail gaps are about the same width as the oil ring grooves plus their gap in the bore. So for a typical 86mm bore piston with 4mm wide oil rings, the assembled oil ring rail gaps should be about 5mm. This is a rule of thumb guide, not a measurement! Use a good quality ring compressor to make sure that the rings are not damaged upon assembly to the bore. Use a good quality oil, change it and the filter after 1,000 kilometres, and avoid additives as these may delay or prevent bedding in. Running in of rings: subject the engine to some reasonable load in the first 50 kilometres and avoid prolonged idling or lightly loaded conditions. Q The gaps I measure are too big according to the fitting instruction. What is the maximum allowable? A The maximum allowable compression ring gap is .008" per inch of bore diameter. This gap is theoretically possible in an engine being re-ringed when the bores are slightly worn, or in a cylinder when the bores are honed to suit a piston at the top end of the tolerance range. This gap will not be excessive in service (Remember that replacement ring sets have to cover a wide range of bore sizes, from bores at the bottom end of the tolerance range to those which may be worn or at the top end of the range. For every .001" increase of bore size the ring gaps will increase by 0.003"). Q How can I make sure that the oil rings will have enough load? A Oil ring load can only be measured in the factory. However a good indication can be obtained if you measure the free gap of the rails, once assembled onto the piston. If the free gap of the rails is more than the width of the groove, the load is correct. For a groove width of, say 4mm, the assembled rails should have a free gap of about 5 mm minimum for them to have the right amount of deflection to give the required wall pressure. Q Can I put the expander into the bore to check if the ends meet? A No, placing the expander into the bore only tells you its length relative to the top of the humps - these vary in height according to the expander design. The rails are supported on tabs near the ID of the expander and it is the diameter at this point that matters - and you can't measure that. Q Should the rings be lubricated prior to assembly into the bores? A Yes, oil the rings with clean engine oil. Do not use anti-scuff lubricants such as molybdenum disulphide or graphite compounds etc. Q Can rings be assembled into the bores without using a ring compressor? A No, if you try to push the piston assemblies into the bores without using a ring compressor you may damage the lower edges of the compression rings. It will also be very difficult to get the oil rings to go into the bores. Q What if the bores have a large chamfer, will this help? A Yes, but it is still necessary to use a ring compressor. In any case a large chamfer is not desirable as it may cause a problem with the seating of the head gasket. Q What brand and type of oil should I use for my reconditioned engine? A We recommend the use of a premium multi grade oil of SAE 15W/40 or 20W/50 (or 25W/50) conforming to API SG specification. We recommend major oil company brands as the have undergone the greatest research and testing. 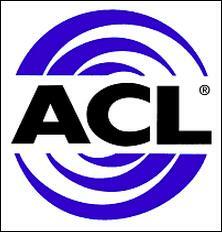 *Automotive Components Limited, Australia's largest manufacturer of original equipment and aftermarket engine parts.